by Marieb, Elaine N.; Wilhelm, Patricia Brady; Mallatt, Jon B. NOTE: Before purchasing, check with your instructor to ensure you select the correct ISBN. Several versions of MyLab & Mastering products from Pearson exist for each title, and registrations are not transferable. To register for and use MyLab & Mastering products from Pearson, you may also need a Course ID, which your instructor will provide. If purchasing or renting from companies other than Pearson, the access codes for MyLab & Mastering products from Pearson may not be included, may be incorrect, or may be previously redeemed. Check with the seller before completing your purchase. 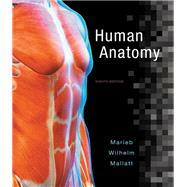 The #1 best-selling book for the human anatomy course, Human Anatomy, Eighth Edition is widely regarded as the most readable and visually accessible book on the market. The book’s hallmark strengths–detailed art that teaches better, a reader-friendly narrative, and easy-to-use media and assessment tools—are enhanced through assignable anatomy animations and tutorials in MasteringA&P, more prominent in-book media references, and updated Focus Figures. Within the book, photos reinforce real-world applications, and cadaver photos and micrographs appear side-by-side with art, working together to help readers accurately visualize key anatomical structures. For Elaine N. Marieb, taking the student’s perspective into account has always been an integral part of her teaching style. Dr. Marieb began her teaching career at Springfield College, where she taught anatomy and physiology to physical education majors. She then joined the faculty of the Biological Science Division of Holyoke Community College in 1969 after receiving her Ph.D. in zoology from the University of Massachusetts at Amherst. While teaching at Holyoke Community College, where many of her students were pursuing nursing degrees, she developed a desire to better understand the relationship between the scientific study of the human body and the clinical aspects of the nursing practice. To that end, while continuing to teach full time, Dr. Marieb pursued her nursing education, which culminated in a Master of Science degree with a clinical specialization in gerontology from the University of Massachusetts. It is this experience that has informed the development of the unique perspective and accessibility for which her publications are known. Dr. Marieb has partnered with Benjamin Cummings for over 30 years. Her first work was Human Anatomy & Physiology Laboratory Manual (Cat Version), which came out in 1981. In the years since, several other lab manual versions and study guides, as well as the softcover Essentials of Human Anatomy & Physiology textbook, have hit the campus bookstores. This textbook, now in its 10th edition, made its appearance in 1989 and is the latest expression of her commitment to the needs of students studying human anatomy and physiology. Dr. Marieb has given generously to colleges both near and far to provide opportunities for students to further their education. She contributes to the New Directions, New Careers Program at Holyoke Community College by funding a staffed drop-in center and by providing several full-tuition scholarships each year for women who are returning to college after a hiatus or attending college for the first time and who would be unable to continue their studies without financial support. She funds the E. N. Marieb Science Research Awards at Mount Holyoke College, which promotes research by undergraduate science majors, and has underwritten renovation and updating of one of the biology labs in Clapp Laboratory at that college. Dr. Marieb also contributes to the University of Massachusetts at Amherst where she generously provided funding for reconstruction and instrumentation of a cutting-edge cytology research laboratory. Recognizing the severe national shortage of nursing faculty, she underwrites the Nursing Scholars of the Future Grant Program at the university. Dr. Marieb is an active member of the Human Anatomy and Physiology Society (HAPS) and the American Association for the Advancement of Science (AAAS). Additionally, while actively engaged as an author, Dr. Marieb serves as a consultant for the Benjamin Cummings Interactive Physiology® CD-ROM series. Patricia Brady Wilhelm received her Ph.D. in biological and medical sciences from Brown University and is currently Professor and Chair of Science at Johnson & Wales University, Providence RI. She has taught human anatomy at Brown University, Rhode Island College, Community College of Rhode Island, and currently at the Center for Physician Assistant Studies at Johnson & Wales University. Dr. Wilhelm’s commitment to teaching has been recognized throughout her career. In 1991 she received the Presidential Award for Excellence in Graduate Teaching from Brown University and in 2011 the Teaching Excellence Award from the Community College of Rhode Island. Dr. Wilhelm’s embraces innovation in the classroom and laboratory, incorporating Project Based Learning, POGIL activities, cooperative team-based dissection and other active learning strategies into her courses. The driving factor behind these innovations is the desire to aid student learning by making course materials accessible and to make the study of anatomy an active and interactive process. Dr. Wilhelm has shared her tools, techniques, experience, and enthusiasm for student success through professional presentations at national and regional meetings, including those of the Human Anatomy and Physiology Society (HAPS), the New England Biology Association of Two Year Colleges (NEBATYC), and Strategies to Success Conferences. In addition to teaching, Dr. Wilhelm contributes to the development and use of multimedia course tools for human anatomy instruction, is a contributing author and reviewer for a number of anatomy and physiology publications, and is a reviewer for Anatomical Sciences Education. She is a member of Sigma Xi, the Human Anatomy and Physiology Society, the American Association of Anatomists (AAA), and the PULSE (Partnership for Undergraduate Life Science Education) Community. Jon Mallatt earned his Ph.D. in Anatomy from the University of Chicago. Dr. Mallatt is currently an Associate Professor of Biological Sciences at Washington State University, where he has been teaching human anatomy to undergraduates of all backgrounds for 24 years. He is also a member of the department of Basic Medical Sciences, where he teaches courses in Histology and Anatomy of the Trunk in the WWAMI Medical Program. WWAMI honored him with their "Excellence in Teaching Award" in 1992, 1993, 1995, and 2000. Additionally Dr. Mallatt holds a position as adjunct Associate Professor in the department of Biological Structure at the University of Washington. His particular areas of expertise in the study of anatomy are histology, comparative anatomy, and anatomical drawing, although his research now focuses on the origin of vertebrate animals and molecular phylogeny. Dr. Mallatt is an accomplished researcher with 39 publications in the fields of anatomy and molecular phylogeny to his credit.